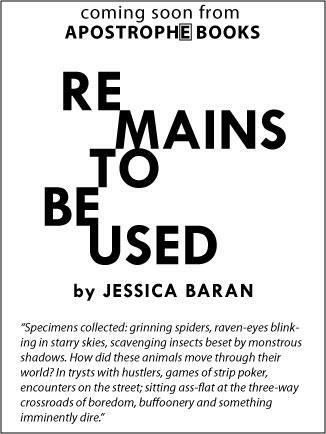 We are pleased to announce the forthcoming publication of Remains To Be Used by Jessica Baran. Like bizarre and often intense conversations, each poem in this collection is ekphrastic. The poet responds to and engages with works by artists, writers, musicians, and filmmakers as diverse as Sergio Leone, Joy Williams, Robert Altman, Raymond Roussel, Lewis Carrol, Robert Gober, Sigmund Freud, Jacques Derrida, Luis Buñuel, Alfred Hitchcock, Gertrude Stein, Hank Williams and many more. . . .
Baran challenges the reader to rethink the way in which we view, create, represent and recreate human experience through various mediums. The reading experience is strangely voyeuristic in that Baran provides a kind of heuristic glimpse into these different aesthetic experiences. You’ll feel as though you are peeking-in on a mind tangling and untangling the complexities of a performance by Jan Bas Ader, a poem by Wallace Stevens, or a video installation by Eija-Liisa Ahtila. Baran seems equally adept investigating a film like The Good, the Bad and the Ugly as she is at exploring Specters of Marx by Derrida. The book will be available this summer from this website, SPD, Amazon, or for order at your local bookstore. Check back for date of publication and availability. In the meantime, for a glimpse of Baran’s work, click here: Remains to be Used_SAMPLE. This entry was posted on Friday, May 21st, 2010 at 6:44 pm	You can follow any responses to this entry through the RSS 2.0 feed.